RWO Veolia is presenting its new products RWO-CBM and OWS-Controller at this year's leading trade fair SMM, focusing on the main topics of smart shipping and green technology. The products are milestones in the development of a fully digitalized system maintenance and will already make the operation of water treatment plants on ships and offshore platforms much more efficient, transparent, safe and environmentally friendly. The Bremen-based water specialists will talk about the advantages of the products and their vision for shipping 4.0. 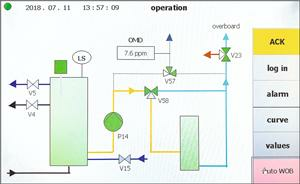 The full potential for optimizing water treatment on board is realized by the Clean Bilge Monitoring system RWO-CBM. The system comprises the software RWO-Link and an intelligent bilge economizer. RWO-CBM acts as the final level of control before water is drained off the ship. A 3-way valve automatically governs incoming wastewater which has been analysed and transfers it either directly overboard or into the bilge water tank for further treatment. This reduces the operation time of the systems to a minimum. By accessing GPS coordinates, it automatically detects whether the ship is within Special Areas and, before discharging the bilge water, determines whether the maximum ppm values of 15 (or 5 or 0 in special protection zones) for oil content prescribed by the IMO are being observed. Therefore it automatically prevents the intentional or unintentional discharge of contaminated water and thus high penalties. In combination with the new software RWO-Link, data can additionally be sent from board to the shipping company using the ship's communication systems. Theoretically, live data could also be transmitted to RWO Veolia, in order to use a remote service. "By analyzing the data and due to our global network, we would be able to optimize the supply chain for spare parts. If we already realize that a part will have to be replaced soon, we can calculate the best and fastest maintenance option to minimize downtime." says Fechner. The remote service program is currently in development. In the context of RWO's main theme "total intelligent water management on board ships" the topic of ballast water will also take center stage at this year's SMM. After actively observing and evaluating the situation in the ballast water market, especially in terms of USCG and revised IMO G8 regulations, RWO has signed the letter of intent to gain USCG type approval for its Clean Ballast system in June 2018, formalizing the decision to continue with the development of a ballast water treatment system. The land based test is commencing summer 2018 and a partner for the shipboard test has already been confirmed. This strengthens the company's positive outlook towards achieving IMO G8 and USCG type approval. Alfa Laval PureBallast 3, the third generation of manufacturer Alfa Laval’s ballast water treatment technology, has received an updated type approval from the U.S.